When summer began, if you took exit 7B off of Route 42 in Gloucester Township, N.J., you would have navigated around a relatively new set of traffic circles in the middle of verdant, unused farmland. If you take the same exit today, you’ll notice mounds of dirt and some earthmovers behind a freshly erected chain-link fence, and construction workers toiling in the midday sun as cars zip down the highway. The workers are prepping this slice of land between the Black Horse Pike and route 42 to become home to the Gloucester Premium Outlets, a 90-store, approximately 413,000-square-foot outdoor outlet mall – not including the additional 32,000 square feet of room for later expansion– that is slated to open Aug 13, 2015. 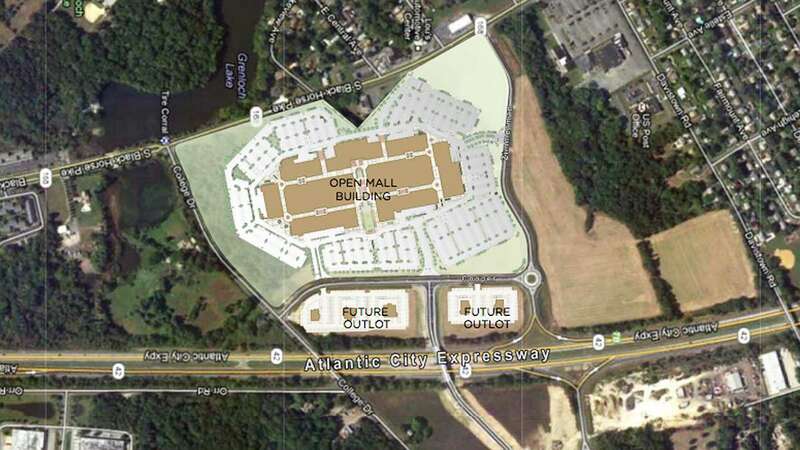 The project is a joint venture between PREIT-Rubin, which owns the Cherry Hill Mall, Cumberland Mall, the Voorhees Town Center and other properties, and Simon Property Group, which owns over 307 properties in the U.S., including outlet centers and indoor malls like the Philadelphia Premium Outlets and the Jersey Shore Outlets in Tinton Falls, N.J., and many more internationally. 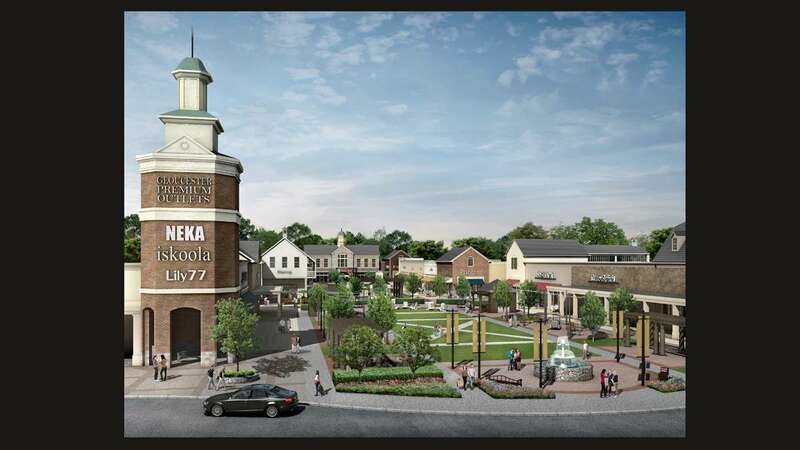 The 65-acre mall in Camden County will sit between College Drive, Zimmerman Drive, the Black Horse Pike and Route 42, and will be composed of nine separate buildings. The center will be an open-air, racetrack design like many of Simon’s other properties, where stores face inward along a path that lead customers around the circuit. Parking will be located in a ring around the stores. The center will be slightly unique, however, because of its larger-than-usual green space in the middle of the complex that will feature outdoor seating, food kiosks, fire pits and more green space than other Simon outlets. 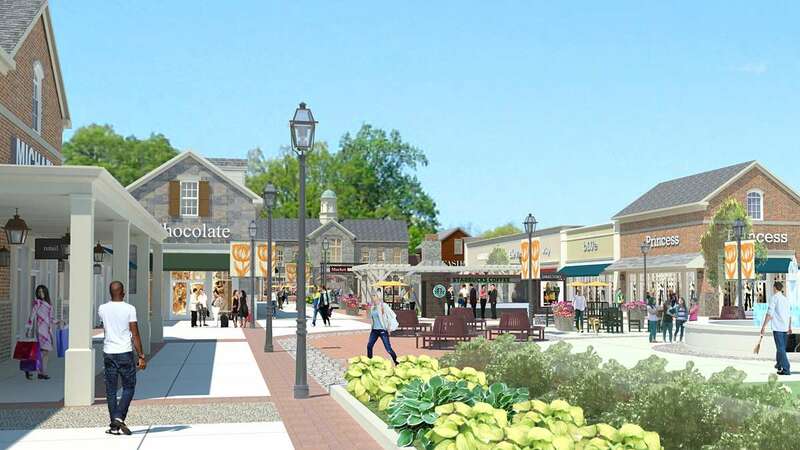 Gloucester Township mayor David Mayer said he wanted the shopping center to have the expanded green space after he visited the Philadelphia Premium Outlets in Limerick, Pa., and noticed that the shopping center was mostly concrete. Besides receiving a tax abatement, which is offered to all new commercial developments in the township, Simon is footing the over $100 million price tag for the outlet center. 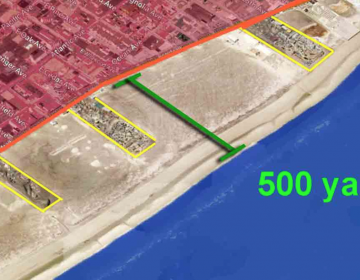 The abatement allows the developers to pay zero taxes on improvements to the property during their first year, and then pay 20 percent on improvements their second year, and so on until they reach 100 percent over a total of five years. There have been a few waves of popularity for outlet malls since the early 1990s, but they really took off after the Great Recession, according to Linda Humphers, editor-in-chief of Value Retail News and International Outlet Journal, two trade publications from the International Council of Shopping Centers. Outlet malls traditionally have sold the overstock from brands looking to get rid of excess or out-of-fashion inventory. As the popularity of outlet malls grew, brands started producing discount merchandise specifically for outlet stores. These days, outlet malls tend to attract upper-middle-class shoppers looking to save some money on brand-name merchandise from brands like Coach, American Eagle, Michael Kors and others. Since 2006, about 40 outlet malls have opened in the United States, versus just one traditional indoor mall, according to ICSC’s 2014 Outlet Tenant Report. Outlet centers usually start smaller and have the option to add (or subtract) as the market dictates, unlike traditional malls, which are prebuilt with a certain number of stores that they have to fill. Some spaces in traditional malls are also built with specific tenants in mind – department store anchors usually require large, multi-level spaces in traditional malls – which can be awkward to fill once vacant. Outlet malls, however, usually have several different buildings of more-or-less standard size, which can be divided or widened as needed. Outlet malls have been seeing steady growth since the early 2000s, according to John Pasquarella, managing director at Integra Realty Resources in Philadelphia. “It’s just been growing and growing and growing as [retailers] have been trying to get rid of merchandise at discount to…clear inventory,” he said. Experts like Humphers and Pasquarella expect the Gloucester Premium Outlets to continue the trend of outlet success. Arguably, the township’s greatest asset is its access. The center will be accessible immediately off of exit 7B on Route 42 and is convenient to the Atlantic City Expressway and the Black Horse Pike. Those roads are easily accessible via I-295, route 30, among others. 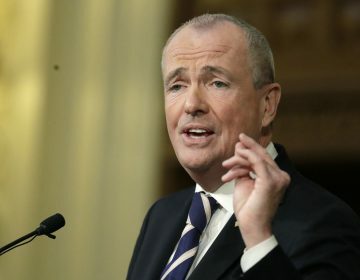 The outlet’s location also makes it closer than the Philadelphia Premium Outlets and the Atlantic City Outlets for people in Cherry Hill, Moorestown and other South Jersey towns. 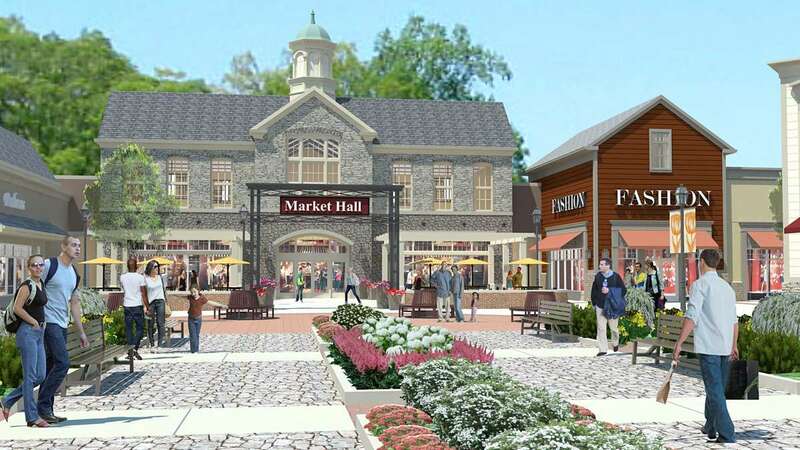 Gloucester Township politicians have touted the Gloucester Premium Outlets as a boon for the 45,000-person township. At the very least, the new property will add $1.4 million in annual property taxes to the township’s coffers. Gloucester 42 Associates LLC, a subsidiary of Cooper Health System, owns the land on which the outlets are being built. 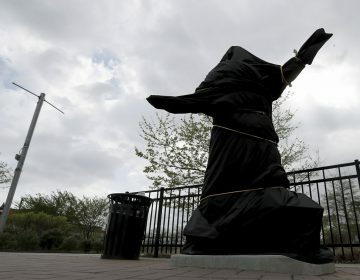 The land is zoned as a “redevelopment area,” which allows the Gloucester Township council to have a stronger say in how the land can be developed without having to go through the planning and zoning boards to amend the township’s Master Plan, which oversees how land can be developed. No stores have been announced yet, and aren’t likely to be announced until close to the grand opening next summer, but a look at other Simon properties offer an idea of what kind of stores to expect, according to De Vita, from Simon. De Vita estimates that the outlet will bring around 300 construction jobs and around 800 permanent part- and full-time jobs to the township.